Notes for the Archive Project: Day Five. 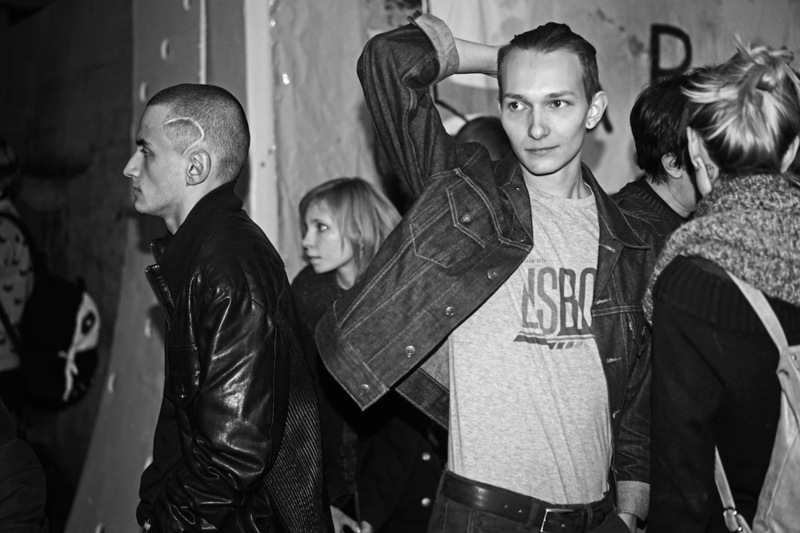 In Gosha Rubchinskiy's photograph taken from his collection titled Youth Hotel, it is the eyes, the eyes of the young man fixed in the center of the photograph, upon which the entire image radiates. Of course he is also towering above the other figures and his facial structure is beautiful—both child-like while, at the same time, angular. To his left are another young man and a young women—they might be his friends. They seem similar in their subtle deviance—the man wears an oversized leather jacket and has a shaved head which allows us to see the long curved scar that appears on his scalp. The young woman is a blur in the background. What she is wearing is not evident and due to the blurring, but she too, like the scared man, is looking in the opposite direction of the man in the center. I assume they are watching a band perform on a low stage. To the right of the man in the center are a woman and man both wearing sweaters, and one with a backpack. Because of their attire, their sweaters and backpacks, my guess is that they are of another crowd. They are onlookers while the three in the center of the photograph are active, alive. They are the center. But back to the eyes. It is in the man’s eyes that he is smiling. There is something open about them. And this openness, this opening up, is what changes the photograph. It is a kind of halo washing over the photograph and it begins with him. He is not looking where the others are. And wherever he is looking, his eyes are happy. The sensualness of his hand behind his head, too is a form of openness. And this gesture, too, alters the image—opens it, hinges the photograph open. Desire is in his eyes. He is seeing something he wants. That we don't know, that what it is exists off camera, in the gutter of it, adds to the energy of his desire and of the photograph. Desire is always something we want, and something we cannot have, at least not during the moment we are wanting it. Desire becomes stronger as this aspect becomes stronger. The man’s eyes are desiring something, something only he can see, something off camera. And perhaps this not-seeing--our inability to see what he desires--is not entirely coincidental. What we desire is often not the thing itself--the person, the object--but what hovers around it, something intangible, not seeable. And because we cannot see or even comprehend what it is precisely that we desire, one more layer of desire is added on and, with it, one more layer of remove. This, of course, causes more pain. Inside of desire is pain--the space between where we are and where the object of our desire resides. This reach is want and the longer we remain within this space and the larger the space--the bigger desire, the larger the pain. We cannot get to it--it is beyond our reach. And in this way desire is a kind of death. Because it does not exist—in this image—resides only in the gutter of the image—it asks of him, the man who desires it, to move out of his world, his realm, and step toward the abyss. This is often what desire asks of us. And this explains the smile in his eyes—and the slight turn of his lips toward a smile. He is both inside the room, inside the confines of the frame of the photograph, and he is not--he is already elsewhere. His mind and his spirit are where his desire is. This fragmenting--the break of the body, mind and spirit when desire enters the picture--is violent, is a death of sorts. But of course, it is also, an absolute beginning. Desire, Archive Fever, asks of us a kind of death, a violence that is also an energy, an energy that is filled with life.